Below is the text of the speech made by the then Chancellor of the Exchequer, Gordon Brown, on 12th June 1997 at the Mansion House in London. I am pleased to attend the Lord Mayor’s dinner here at the Mansion House. 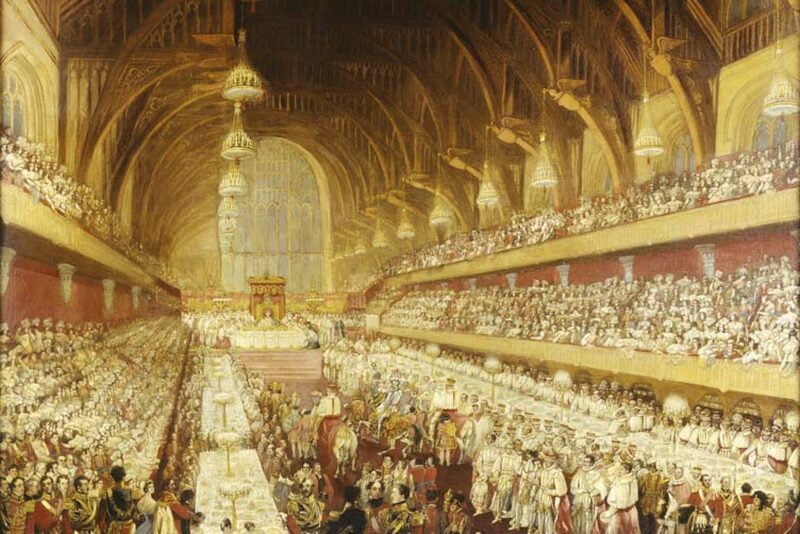 An annual dinner that has been going since mid-Victorian times, celebrating an institution, the Corporation of London, that has lasted since the 11th century. Tonight a third of our guests are from overseas, including from Frankfurt, New York, Japan and Hong Kong. A clear example of the internationalism, the openness and global reach of the City today and an illustration of how the City has changed in response to changes in the economy around it. And I am pleased to speak alongside, not only the Lord Mayor, whom I thank for his invitation, but also the Governor of the Bank of England. The City of London has established itself as one of the world’s greatest financial centres for over three hundred years. At each stage the City has continued to respond imaginatively to the need for change: from the days in the 17th century when Edward Lloyd discovered the post office had become a better source of shipping information than the waterfront and moved his coffee house from the docks to Lombard Street; to today, when face to face contact, telephones, and ledgers have been replaced by computer screens and electronic information. and perhaps most relevant of all, to the bewildering changes we see around us, continuously willing to respond and adapt to changing conditions and emerging technologies. And these qualities – evident in the City from its earliest years – the qualities that make for the British genius – are exactly the qualities required to succeed in today’s global marketplace. that Britain’s overseas earnings from financial services amount to 12 billion Pounds a year. And it is because of its adaptability, its innovation, its dedicated workforce – managers and employees alike – and its willingness to embrace change that the City is well-placed for the 21st century. If the City is to succeed today and tomorrow in an ever more competitive international marketplace it must be prepared to continuously adapt to ever greater change. And so too must the rest of the British economy be prepared to change if it is to prosper . In a global marketplace characterised by ever more fierce competition, and unparalleled waves of technological change, we need – more than ever before – to be able to respond to change. How we as a country prepare ourselves for these challenges of the future is the subject that I want to address this evening. In this new economy our task is to ensure that, as individuals and companies and indeed as a country, we are fully equipped to contribute to and compete within this global marketplace. While our national objectives of high and stable levels of growth and employment are unchanging, they can only be achieved in a new world by new methods and new policies. I want to suggest tonight that we need as a country to take a long view of what needs to be done, set in place a foundation of monetary and fiscal stability that will last, and make long term decisions too about how we remove the obstacles to dynamism in our economy and make supply side improvements that are are needed to deliver higher levels of investment, growth and employment. And let me say that this global economy, characterised by rapid and all-pervasive change, stability is more important than ever. The stability of the post-war period was achieved within a relatively closed economy, with national financial markets, fixed exchange rates and frequent recourse to capital controls. Today stability has to be won in an environment of global capital markets where investors have more choice and more freedom than ever before, and where day to day flows of capital are greater and faster than ever before. It used to be said that a week is a long time in politics. Now an hour can be a very long time for a government that loses credibility in international capital markets. Today the judgement of the markets – whether to punish or to reward government policies – is as swift as it is powerful. The evidence shows that, over the long-term, investors will choose to invest for the future in a stable environment rather than an unstable one. Many of our competitors have enjoyed higher levels of investment than us, for the very reason that they have delivered more economic stability. For in the new global marketplace there are no short cuts to long-term prosperity. To succeed, countries must convince the markets that they have the policies in place for long-term stability. After a century of relative economic decline, we have to move Britain up the world economic league . I believe therefore that now is the time to lock into place long term policies for stability and for growth which will encourage investment, overcome the obstacles to dynamism, and make for better employment opportunities for our citizens. If we are to achieve these objectives, there are five barriers to success that this country has to tackle. We must overcome instability and imprudence in public finances. We must address under-investment and unemployment, and avoid the risk of isolationism. So I believe we must overcome these challenges by making, as a country, five long term commitments. and let me add one further long-term commitment; a long term commitment to free trade and to Europe with policies I want to outline for constructive engagement in the developed world’s largest open market. So it is because we intend to play our full part in equipping the country for the future that this government will give short shrift to short-termism. Step by step, I want our government to overcome each of the barriers to our long-term prosperity as a nation. and, with its concentration of welfare to work measures it will take the first in a number of steps we are determined to take to modernise the welfare state, and equip our country for the future. We must start from the foundation of monetary stability. The challenge for this government, has been to establish a credible long-term approach to monetary policy, that tackles the root causes of inflation, including the capacity constraints that have so often derailed recovery and convinces investors that they can expect stable non-inflationary growth that lasts. Consistently low and stable inflation is essential to encourage the long-term investment on which high levels of growth and employment depend. Since I became Chancellor, a lot of attention has been focused on the specific details of our institutional reforms giving the Bank new monetary policy responsibilities. But these highly-publicised changes are the means by which we will deliver a more fundamental and long-prized objective that has eluded Britain for years – to create a lasting framework for monetary stability. During the last two decades governments have adopted and then abandoned a succession of monetary targets – sterling M3, M0, the ERM. And, far from delivering monetary stability, Britain has suffered the most volatile inflation record of any G7 country in the last 10 years. And we have had the lowest investment as a share of GDP. Our new monetary framework is established on the basis of clear principles: it is for the long-term; it sets clear rules, and clear divisions of responsibility; and it is open, transparent and accountable. The government’s role is clear – to set the economic objectives and, in particular, the inflation target. The Bank of England’s role is clear – to take the operational decisions to meet the inflation target. Interest rate decisions will be free from any political influence. They will be recognised as being based on good long-term economics: beyond any accusation of bad short-term politics. My appointments to the Monetary Policy Committee, made with the Governor’s agreement, were based on economic expertise, not party political persuasion. The new Monetary Policy Committee has already shown it is prepared to take the action necessary to keep a lid on inflation. Demand in the British economy is growing faster, but because the economy we inherited suffers from a long-term lack of investment in capacity and in skills, the recovery needs to proceed steadily to avoid a rebound in inflation. And it was because of this I decided to raise interest rates in May. We must break out of the stop go cycle under which, every time we expand, capacity constraints and under-investment trigger inflationary pressures. Progress has already been made in building our anti-inflation credibility. Long-term interest rates and inflation expectations have fallen. But to create the lasting stability I want, we need to go further. We need to lock into our economic policy a commitment to consistently low inflation over the long term. Real stability is achieved not when we meet a target one or two months in a row, but when we can confidently expect inflation to be consistently low for a long period of time. We need a long-term monetary policy framework. This afternoon in the House of Commons I affirmed the inflation target. Tonight I will explain how I am completing my reform of monetary policy, by introducing more rigorous, precise and open procedures. That will help the Bank of England to deliver the inflation target consistently over the long-term. If inflation is 1 per cent higher or, for that matter, lower than the target of 2.5 per cent, then the Governor, on behalf of the Monetary Policy Committee, should write an open letter to the Chancellor. how this approach meets the Bank’s objectives as set by the government. Of course, any economy at some point can suffer from external events or temporary difficulties, often beyond its control. Attempts to keep inflation at the target in these circumstances may cause undesirable volatility in output. But, if inflation is still more than 1 per cent away from the target after three months, I will expect the Governor to write to me again. Instead of the old procedures that were ad hoc, personalised, and could not last credibly for the long term, this government has set in place clear rules, divisions of responsibility and a target supported by tight procedures for monitoring whether it is delivered. It is because there are clear rules and rigour that our approach will command greater confidence. Over the coming years I want the British economy to enjoy the far greater underlying strength that comes from a base of low and stable inflation. If we succeed in strengthening the ability of the British economy to sustain growth with low inflation. And if international conditions permit, I would hope to lower the inflation target. But the long-term inflation target of 2.5 per cent I have reaffirmed for the Bank of England today, reinforced by the open letter system, provides the final building block for our new framework of British monetary policy. The open letter is yet another example of the government’s commitment to a more transparent and accountable system of monetary decision-making. Building a platform of long-term stability means not only a stable monetary framework for the long-term, but government must play its own role by achieving sustainable public finances for the long-term. That is why yesterday the Chief Secretary announced our plans for a comprehensive review of all government spending. This will be a root and branch appraisal of how we can improve the efficiency of government in meeting our objectives for improving investment, opportunity, fairness and employment; how we can make better use of government assets; and, finally, how we can best make use of public/private partnerships to harness new sources of financial and management expertise. The review will ensure that our public spending decisions reflect our long-term priorities, and meet the country’s long-term needs. Our determination to have long-term stability in the public finances lies behind our commitment to draw up a national register of government assets. One of our departments alone has 90,000 buildings. We are committed to ensuring that government assets are used efficiently to deliver our priorities and we will not hold assets that have no further use. I can announce tonight that we have asked departments to complete this register by November, so that it can inform the conclusions of our Comprehensive Spending Review. And just as we will resist any other irresponsible demand on public spending, we will resist irresponsible public sector pay demands. Alongside the Comprehensive Spending Review, we will introduce tough rules for government borrowing. Two central principles will guide our approach. First, meeting the golden rule for borrowing. Over the economic cycle, the government will only borrow to finance public investment and not to fund public consumption. Second, alongside this golden rule commitment, we will keep the ratio of government debt to GDP stable on average over the economic cycle and at a prudent and sensible level. But we will only achieve and sustain monetary and fiscal stability if we can strengthen the underlying capacity of the British economy. For too long investors have recognised the importance of stability and taking a long-term view, while governments have not. Long-term investment holds the key to our future prosperity in Britain. That is why I am determined to put in place the conditions that will encourage the high levels of investment we need. But it is also crucial to improve the supply-side of the economy – to remove the obstacles to dynamism, and make it possible for us to sustain high and stable levels of growth with low inflation. Geoffrey Robinson, the Paymaster General, will head an Enterprise and Growth Unit in the Treasury which will work with business to nurture innovation and entrepreneurship. And he has asked Malcolm Bates formerly deputy managing director of GEC, to undertake a thorough-going review of the Treasury arrangements for PFI projects to ensure quicker and better decision-making. We need to seek public/private partnerships to deliver better public services and investment. And I am determined that the private finance initiative has a new start. And I am also determined that we improve the competitiveness of our marketplace so that investment levels can rise. Stability provides the platform. But we cannot build a dynamic economy unless we can unleash the potential in everyone. A welfare state that thwarts the opportunities that we need, will hold the economy back. A welfare state that encourages work is not only fair but makes for greater dynamism in the economy. This new approach to welfare aims to strengthen the supply side of the economy and so contribute to the maintenance of long-term stability. The three modernisations we propose – of employment policy, of tax and benefits, and of lifelong learning – reflect our determination not merely to compensate people for their poverty, but actually to tackle the causes of poverty by means that provide opportunity and so strengthen our economic performance. Britain cannot succeed unless we develop our greatest asset: our people. The new realities of fast changing labour markets mean there is a constant need for retraining and upskilling by the British workforce in the new global economy . So the starting point of our reforms is our welfare to work programme. It will be aimed at helping 250,000 young and long-term unemployed people into work by giving them opportunities to learn, train and gain employment. But we will also modernise the tax and benefits system to ensure that people have jobs, are able to keep the jobs they have, and are able to move into better jobs. We cannot build a stronger British economy in isolation. Europe is where we are, where we trade, and where we make our living. 60 per cent of our trade and 3.5 million jobs depend upon it. It is vital that investors have confidence in our relationship with Europe. I can put that beyond any doubt tonight: Europe is where we are and where we will stay. Our long-term commitment to Europe means that it is essential that we must play a leading role in shaping Europe’s future. We will pursue a British agenda to equip Europe for long-term success. That is what the British initiative that I launched last week to get Europe to work was all about. We will push ahead with the completion of the single market. David Simon is taking forward the government’s competitiveness agenda in Europe. He will promote flexible labour markets across the EU and work to break down the barriers to competition in the single market. Tonight’s audience will recognise that there remain major barriers to free trade in financial services in the EU. We are working hard to overcome those barriers. It is in every country’s long-term interest to have internationally competitive industries, trading freely in an open market. A lot has been written and said about the first days and weeks of the new government. Popularity in politics will ebb and flow, but the true test of the announcements and reforms we are making is not the response we have received or will receive in the short term but the results these reforms achieve in the long term. In our monetary and fiscal policy we are determined to chart a consistent course, not for a few months or even a year or two, but for the long term. By being better equipped for the future, Britain and the British people can and will be better off.